In a recent conversation with a friend I mentioned that my favourite film was Goodfellas, she thought for a moment and then agreed that it was one of her favourite films too. On days when I seem to be multi-tasking within an inch of my life I am always reminded by Goodfellas, the part where he is making the sauce for the meatballs, organising the drug drop, dealing with his mistress and sniffing more and more cocaine, the pace gets faster and faster as the helicopters circle and I always watch on the edge of my seat, transfixed. Ok, maybe my crazy days aren't quite like that but I appreciate the feeling. I have thought about my choice for a long time, I know a lot of we craft blogger ladies go for Breakfast at Tiffany's and indeed I think that film very good, it's right up there in my top five and I begin to sob long before it even gets close to the bit were she throws cat out of the car but it's not my favourite. Goodfellas is my absolute favourite followed by American Gigolo - just love that final scene and well, Richard Gere in those tight trousers. Thankfully my clothing choices are not influenced by my top two films and of course the elegantly Givenchy draped Audrey Hepburn is much more inspiring. This is not a new knit, I made it once before. 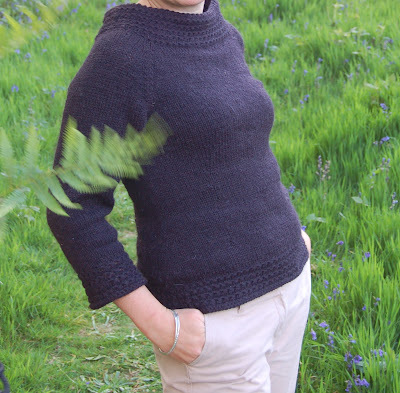 The very Audrey inspired Ingenue sweater from Custom Knits: 25 Projects (Plus Variations) and Techniques for Customizing to Fit Your Style and Your Body . This time I made it in black, and a little slimmer fitting in body and sleeves. I love the neckline of this sweater. And that brioche stitch detail. I used Sirdar Balmoral a mix of wool, alpaca and silk. It is very lovely, very cheap and sadly very limited in colours. Now, I would very much like to hear about your favourite films, please, do tell. Very elegant sweater. The neckline is gorgeous. I think my favourite film of all time is Truly, Madly Deeply. The ultimate love story. Makes me cry every time. Not to mention that Alan Rickman has a voice to die for. One of my favourite films too. And one of my favourite patterns. My Ingenue was 'retired' at the end of winter so I'll have to get another one on the needles soon. I think it is a wardrobe essential! I love the neckline too. And the colour! My favourite movie? Hmmm, that's a hard one... One Flew Over the Cuckoos Nest, I think. What a beautiful sweater! With a perfect neckline. I've not come across that book before, it's now gone straight onto my Amazon wishlist! How lovely you look - the neckline is beautiful. ONE of my favorite movies is Harvey with Jimmy Stewart. It's an old black and white movie, but it just makes me laugh. Really, any movie with Stewart makes my fave list. This is a darling sweater. I like the neckline too. Lovely sleeve length as well. Some favorite films of mine are In the Mood for Love, Enchanted April, Stealing Beauty. I suppose I'm a sucker for landscape and romance. It suits you very well, another lovely sweater you have made! Gorgeous sweater! I've always wanted to knit this pattern... one day I'll there there. Oh that sweater reminds me of Ms Hepburn in the later scenes of Sabrina - all got up in a black, beatnik outfit with cropped hair and ballet pumps. Stunning! Ohh that sweater is gorgeous... you've got me thinking 'Autumn' already! My favourite film.. has to be Chocolat ... I love it. Very lovely and I like the slimmer silhouette. My favourites: North by Northwest, Hope and Glory, this one:http://en.wikipedia.org/wiki/Hope_and_Glory_(film) and Sabrina. I confess I don't think I've seen Goodfellas - have to remedy that! Love that sweater, the yarn looks nice. I really don't know what my favourite film is as I love many of all sorts! About Smicht with Jack Nicolson is fab! I haven't seen any of those films!! Love the sweater! The sweater is fantastic! One of my favourite movies is Orlando. And, as I'm a huge Tilda Swinton fan, I am Love is up there, too! I absolutely love your sweater. Do you take orders? Seriously. I like the 3/4 length sleeve for summer . . . it's almost always "sweater weather" in England. (btw, I was meeting with the Head Teacher today and he said that I must say "autumn" stand of "fall" and "pupil" instead of "student." I do dislike the word "jumper," though; much prefer sweater. As for favourite films: The Piano, Out of Africa, and Persuasion are films that I can watch over and over again. My favourite Audrey Hepburn is probably My Fair Lady. It turned out beautifully! You look so elegant in it. Very Audrey! We are still waiting for summer to begin here (Western USA - Oregon). I'd like to say I've been patient. I haven't. Your weather looks amazing. That sweater is lovely. As for favorite movies...too many to list. I mostly lean toward funny but I did recently watch The Godfather and found that I liked it. If I had to choose a favorite I'd go with The Devil Wears Prada (today). This was one of my most favorite sweaters to knit. Love it in black. I always forget to wear mine in the colder weather.